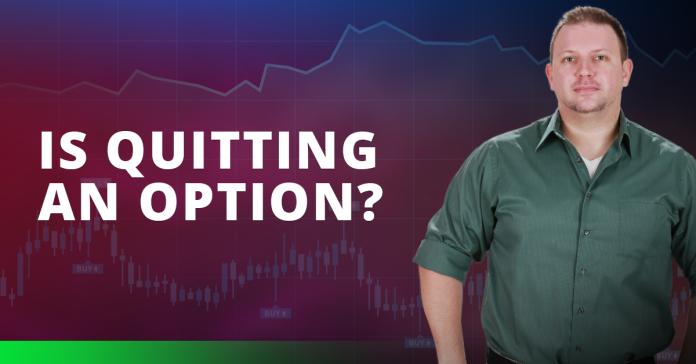 Is quitting an option in forex trading? Home Educational Articles Is quitting an option? Is quitting an option when it comes to trading and life in general? Thoughts about quitting may have crossed your mind if you have failed in trading a few times. Especially if you lost some substantial amount of money. Many have done it. Some may say that “you are just not cut for it” but i don’t thing this is the case. Anyone could be anything. Well almost anything and almost anyone as there is always an exception. I’m not going to dig deeper into exceptions as you are probably not one of them.I have quit only once – i dropped out of college to pursue the career as a trader. As you can see I have reached my destination and now I do what I love every single day, for as long as I want. I wanted this kind of lifestyle, I worked hard for it and I got it. I’m not going to lie to you – there were moments when I was thinking about quitting but I was never a quitter. So if you ask me, no quitting is not an option, it is a path you may decide to take, but once you quit, you will always know that this is an option for you. I’m not talking about trading specifically. You lay a new job, you go for a week but you must switch 2 trains until you arrive. You have other means of income so you decide to quit. I can give you a million examples as the one above. Once a quitter, always a quitter. You should understand that getting out of your comfort zone will only make you a better person. This applies to anything in life. You want to have a six pack and be totally ripped? You must get out of your comfort zone – wake up 1 hour earlier every single morning and dedicate the time to your body, your dream and your goal. Love chocolate cake? Sorry – skip it. And you will have to live with these small “sacrifices” for months until you finally see your six pack on your stomach, instead of your fridge. In ANY relationships, you have to give up on something to get something else. You can’t have it all. The sooner you learn to deal with that the easier all the rest will become. 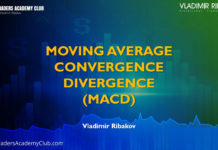 In terms of relations with trading and charts, you have to give up on bad habits. And giving up is a very bad habit, it’s the main habit of losers. Life is puzzle of choices we make. Every decision we take now, is influencing our future. For good or bad. So think about it again – are you a quitter? I want to give you the perfect example of somebody who was right on the edge, woke up, fixed the mistakes, set a goal and reached it – that someone is the football team of Leicester. One year ago no one would have imagined that the English team will have the Premier League medals draped around their necks. Yet here they are. What it took for them to accomplish such extraordinary results? First of all I think we should give a lot of credit to their manager Claudio Ranieri. The very rich CV of the 64 years old Ranieri and his passion along with knowledge made the team to hire him and give him the keys to the club. Claudio is a man of respect and he is a real leader. Players love him.! Someone who can make the whole team work together as a TEAM. Someone who can inspire you and motivate you! Ranieri, when he was still with Chelsea was told by Abramovich (the owner) that he will never win the title. He said that Ranieri isn’t made of materials of champions. Now listen to me here very carefully. Roman Abramovich is TOP in business and he has all the proves for that. But my point here is that he was sure Ranieri isn’t good coach. He isn’t the only one. Ranieri’s nickname was “the ultimate loser” as he NEVER won any championship before and he did have all the tools. There will always be people like that around you. People who will tell you that you can’t make it, that you won’t make it and that you should quit. Don’t ever listen to them. The power of your mind and will can take you to unheard and undreamed placed. Always value yourself as you should be. You can never be someone else, but you can be the BEST you can be. Now back to Leicester – after Ranieri was hired, the miracle happened. Even though the team has faced endless challenges and ups and downs, they did it. And they did it big time. How big? Probably biggest ever. You don’t have to be math genius. You don’t have to have connections to people with huge money (even though it could help). You don’t have to be anything you don’t want to be, in order to become who you really want to be. You have to have ambition. You have to have inner FIRE inside you. You need to have hunger for success. Find your WHY, and the HOW will follow accordingly. 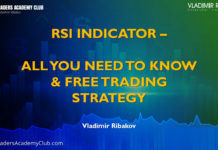 Answer yourself this question – Why you want to be a trader? Make lot of money? Freedom? Have the best options for your family? Buy new house? what is your WHY? If your WHY is real and strong, it will be enough to lead you to find the “HOW” to make it happen. Follow your dream but remember, dreams happen only while you sleep. You can’t live your dream but you can turn your reality to same dream you’ve had. Back to my example of the amazing story of Leicester city football club. They don’t have the biggest names or the top paid players. They have motivated team, inspired by a manager who is a true leader. A team and manager with vision and ambition. Team with simple guys with biggest faith and belief. We see it rarely, but these rare cases prove only 1 thing – it is possible!!! Even if everyone tells you it’s not. If you set a goal and you pursue it with hard work on the way, your dream will become true eventually as long as you……….? You guess right, as long as you DO NOT give up! Believe in your WHY. Believe in yourself. Believe in what you are doing. Instead of re-locating your energy again, figure out what happened, what you did wrong and why you failed. Don’t run to blame others. Figure out if you want to trade for fun, for some extra cash or for living. There is a huge difference and you should be clear what you want. If you think you can’t live with the uncertainty of having your paycheck on the 1st of the month this is not for you. No shame. As always there is balance in life. Freedom and independence but no “certainty”. Whether or not you are going to continue learning the profession, this one or any other, make sure not to be a quitter. Nobody likes such people. They are usually unreliable, untrustworthy and so on. Get out of your comfort zone every single day even if it is 1 cm away. Read 1 page, run 3 minutes, fix at least 1 of the cabinet doors that your wife is asking you to do for months. The beer on the couch is not going anywhere. That would be all for this one. I really hope you liked it but as usual I hope that it made you think about it. Please drop a line below and share your thoughts, also don’t forget to like/share on the social media! 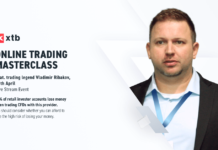 Join Global Online Trading Masterclass! Best essential thoughts in the subject I’ve ever seen, even with various indicators pointing to a improvised text. Few forgivable small mistakes and probably an undervalued article since I’m the first to comment.